As I've mentioned countless times before, I'm a big fan of using Windows Media Center as my DVR for watching and recording TV. But I do have one gripe: Very often I'll pause whatever show I'm watching, only to return a while later to discover it has "unpaused" without my permission. Why? Because Windows Media Center's default "pause buffer"--the amount of hard drive space reserved for live-TV storage--is just 30 minutes. There's nothing to install: Just run the program, choose your desired buffer (any 15-minute increment between 30 and 120 minutes), and then click Apply. Reboot your PC and you're good to go. As a longtime fan of Windows Media Center, I can't believe it's taken me so long to discover My Channel Logos. This free plug-in adds channel logos to the WMC TV guide. Why is this such a big deal? Check out the "before" screen. Here's the "after" screen. Cool, right? Even cooler, My Channel Logos handles all the grunt work, automatically finding and applying logos for over 250 networks. The developer has a fairly straightforward installation guide on his site, so I won't regurgitate the details here. I will mention that MCL requires Windows 7, and that it's free--but the developer requests a $3 donation. I consider that more than fair, so if you find yourself loving this little enhancement as much as I do, pony up. If you're anything like me, you routinely flip through your hundred-plus channels in search of, say, a movie to watch or some college basketball. 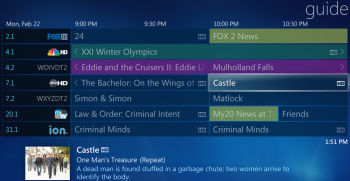 Much as I like WMC's comforting all-blue channel guide, it doesn't let me spot specific types of shows at a glance. Deep within WMC's settings, there's an option to enable color-coded listings. To find it, click through Tasks, Settings, TV, Guide, Guide Page Options, then click the check-box for Apply colored backgrounds to shows, based on their category. Click Save, and your guide looks like the screen linked here. Start Windows Media Center, then head to Tasks, Settings, TV, Guide, Edit Channels. Scroll all the way to the bottom of the channel list (which may be quite long). The Internet TV channels start at 9000. Clear the check boxes next to any channels you want to remove from the guide. Click Save, then head back to the guide to see the results. Don't worry--you can still access these streaming goodies by going to TV, Internet TV. They won't be categorized quite the same, and you may have to use the Search feature to find certain shows, but they're still there.